Built with what is called post frame construction, pole buildings solve many building construction needs. Although the original pole buildings improved over the years, there are many disadvantages that accompany a pole building that you do not find with arch-style steel buildings. Constructed with wood, pole buildings are susceptible to termite infestation and hazard of fire. Steel buildings contain fewer pieces and are much easier to assemble than pole barn kits. 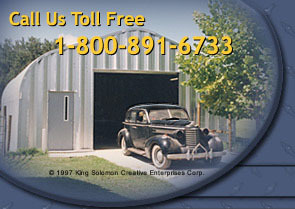 A steel building is an economical and time saving alternative to a conventional pole building.